Apptimize has launched a new A/B testing platform that allows app developers to produce multiple versions of an app, release them to the public simultaneously, and get statically proven results without waiting for additional app store approvals. Not only does this cut months off the development cycle, it also brings analytical rigor to app optimization. 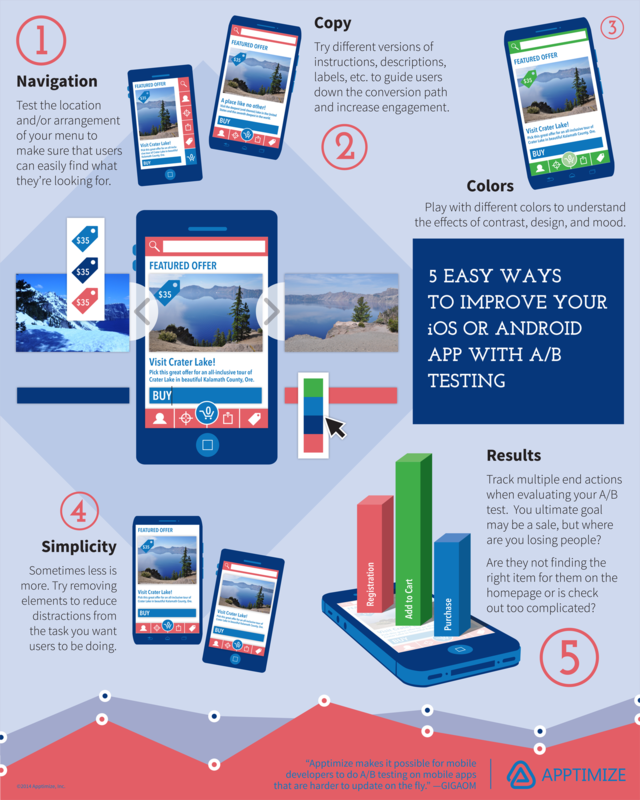 Looking for some ways you can improve your iOS or Android app, Apptimize offers these tips. Apptimize provides developers the opportunity to roll out each change to a subset of users. Developers can roll back features without having to roll back all other bug fixes, and changes can be rolled out to everyone whenever they are ready. Feature flagging allows the ability to innovate quickly because of the available control over which changes are live. Slow rollouts provide an opportunity for the understanding of user behavior and optimizing each feature before releasing it to everyone. The platform’s results page provides direct feedback allowing user behavior to be viewed in real time. Reports are updated as cached data is uploaded. It is easy to see the results of each variation and drill down to see visitor/conversion statistics. The platform’s Visual Apptimizer also enables non-developers to implement many of the tests themselves. A developer can execute a few lines of code in the app to set things up, and other individuals such as product managers, producers, and designers can test different versions of the app without additional coding. The results are measured by Apptimize’s analytics algorithms, and the insight is generated on an easy to use dashboard. Developers can create an account now and get started. For more information visit the link below.